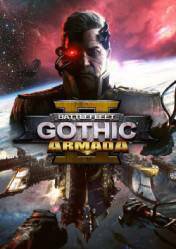 Attention: Battlefleet Gothic: Armada 2 is a game in digital key or Steam key format (although it may also be available in other versions such as Steam Gift), depending on which online store is purchased. Depending on the format it must be activated one way or another. Remember also that they may have regional blocking, so pay attention to this information and check each of the stores. Battlefleet Gothic: Armada 2 is the second installment of the strategy game in which we put ourselves in the role of an admiral in charge of the navies of the most important factions of the 41st millennium. The launch is scheduled for September 2018, when we can once again enjoy the real-time strategy of the epic space battles of the Warhammer 40k universe. This new installment will be bigger, richer, more impressive and more ambitious than the original game. It will include, at launch, 12 factions: the Imperial Navy, the Space Marines, Adeptus Mechanicus, Necrons, Chaos, Aeldari Corsairs, Aeldari Craftworld, Drukhari, Tau Merchant and Protector Fleets, Orks, and finally, the Tyrants. That's right, in this second installment of Battlefleet Gothic: Armada we can enjoy all these races, including the fearsome Tyrants. Battles will be bigger, more refined, with enhanced multiplayer modes and features for a more balanced online experience, as well as overall improvements and even more customization options for fleets and ships. Prepare yourself for wars with the largest imposing battleships in the universe. There are no comments yet about Battlefleet Gothic: Armada 2. You can be the first one!